This area has been the sacred area to offer prayers to Nirai Kanai (world of gods) since the day of old. Each boat going in and out of the commerce base of Naha port looked up to the shrine on top of the high cliff, prayed for a safe journey and expressed their appreciation. The shrine was venerated, and people prayed for a rich haul of fish and rich harvest. Every New Year, the King himself, on behalf of his people visited the shrine to pray for the peace and prosperity of the nation. The shrine was admired as the "primary shrine of the kingdom", head of the Eight Shrines in Ryukyu. It was classified as Kanpei-shousha (nationally significant shrine) in the Meiji Era and became the Okinawa Sochinju (shrine that protects the whole of Okinawa) but it was destroyed during the war. After the war, Shamusho (shrine office) and Honden (main shrine) were reconstructed in 1953, and Haiden (hall of worship) was reconstructed in 1961. In 1993, reconstruction of Honden (main shrine) and other shrines was completed during the Heisei reconstruction project. It was designated as the Naha City Historical Site of Cultural Property in 2006. 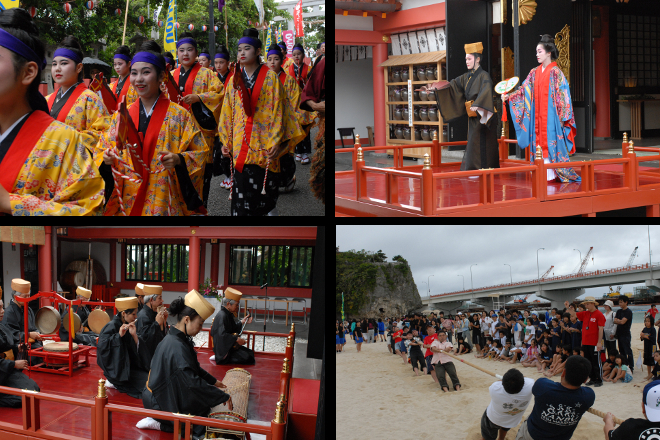 Many events will be held in collaboration with the grand festival on May 17th, Shinkou Festival, Okinawan Sumo Festival, Ryukyu Dance, performance competition, singing contest and beach tug-of-war. We accept various requests, including Shito-style wedding, prayers for safety of the family, prosperous business, newborn's first visit to the shrine, ward off evil spirits, and traffic safety. Naminoue Shamusho (shrine office) is not able to accept the requests during the festival and wedding ceremony, please contact us in advance. There are 80,000 shrines included in Association of Shinto Shrine in Japan, among them 11 shrines are in Okinawa. Asato Hachimangu is one of the eight shrines of the Ryukyu Kingdom with a long history. It was founded in 1466 by King Sho Toku, the 7th king of first Sho dynasty. The origin is when King Sho Toku was on his way to an expedition of islands with a two thousands force, he went through Asato. He saw the bird cry and fly away, so he looked up at the sky and prayed “if I can shoot the bird down with just one arrow, please grant my wish for subjugation of the islands.” Amazingly, he shoots the bird with just one arrow. As troops departed from Naha port in 50 boats, the temple bell adrift on the waves and never left the warship. King Sho Toku vowed “This bell must be granted from Hachiman Bodhisattva. If we acquire the bell, we will definitely win the battle. I will venerate Hachiman when I go back.” He loads the bell into warship and head for the battle. The king achieved victory and returned. The King Sho Toku appreciated divine protection of Hachiman Bodhisattva and fulfilled his vow. He constructed Asato Hachimangu Shrine, along with Koumyouzan Shintokuji temple and hung the bell. This is the origin of Asato Hachimangu Shrine. 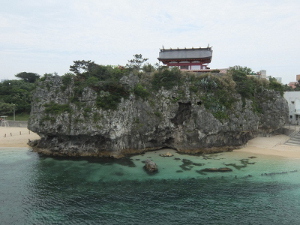 Sueyoshi Shrine is one of the eight shrines of the Ryukyu Kingdom since the dynasty era. It is commonly called “Shadan” or “Shuri Shadan.” According to archives, Kakuo Buddhist, the priest of Tenkai temple, enshrined three deities of Kumano in King Sho Taikyu era (around year 1456). 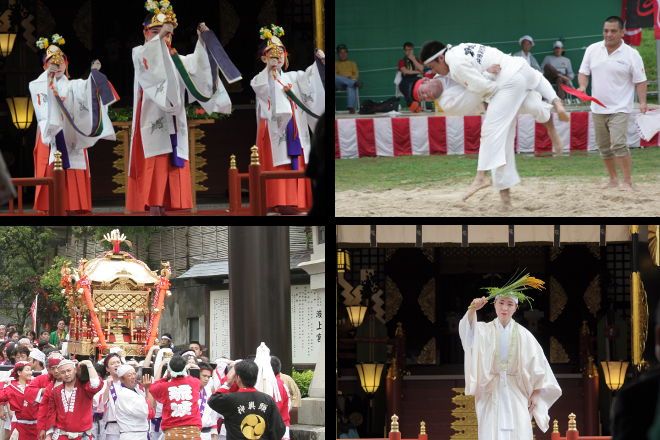 Around the Sueyoshi Shrine, there are subordinate shrines and many sacred places called IBE. It is imagined that this area has been honored as the object of worship and cherished since the days of old. According to Ryukyu History Record (Ryukyukoku Yuraiki), the shrine was founded during the Seika period (year 1465- 1487) and it is one of the eight shrines of the Ryukyu Kingdom. In days of yore, there was a person named Oushi who lived in the village of Mekaru. One day at sundown, he met a noble women with a dignified appearance accompanied by a monk coming down from the mountain. Oushi asked the monk who she was. He replied that he lives on a mountainside but she lives in a forest at the top and he didn’t know her name. Oushi was curious and he paid attention to her. One day, he saw her disappear when she entered into a cave. Oushi was surprised and reported to the retainer of the King. King ordered to place incense in front of the cave to ascertain the truth. When the incense was placed, it burned without lit. Therefore, the king dedicated a shrine to the deity. According to Kyuyo history record, during the King Sho Kinpuku period in the year 1452, a chief adviser Kaiki set an altar and prayed 2 nights and 3 days for completion of the Choukoutei bridge construction. This was because the deep water and the huge waves made it seem almost impossible to complete the construction by human effort. After his petition, the water dried up and a sea floor appeared. Therefore, the construction of Choukoutei Bridge from Asato Bridge to Ibegama completed successfully. The Choujyumiya shrine was dedicated for the Sun Goddess to express appreciation for the divine aid. The shrine was renamed “Ukishima Shrine” in 1942. Potato and brown sugar saved Okinawa. Also, three famous benefactors who had contributed to the development of Okinawa politically are enshrined at Mt. Shiro of Ounoyama in 1937. Since then, the shrine is venerated for social reform and promotion for the industry of sugar, agriculture, and forestry industry and education field. “Yomochi” means “Support the peaceful and prosperous reign” in an archaic Okinawan language. Due to an ardent reverence toward ancestors of Okinawan people, the shrine was dedicated to King Shun Ten who was the founder of the kingdom, King Sho En who was the restorer, King Sho Kei who contributed in cultural development, King Sho Tai who was the last king as a main deity that directed his people in grand scale during the Meiji Restoration and to express debt of gratitude, Lord Tametomo Miyamoto who is a father of King Shun Ten. Shuri castle was selected as the site since it was the center of politics for 700 years during the days of King Shun Ten. The construction of Shuri Castle began in that same year, however, it had burned down during the battle of Okinawa. After the war, the supporters organized a reconstruction association. The current location has been tenanted since 1962 and it is set a small shrine for rituals.